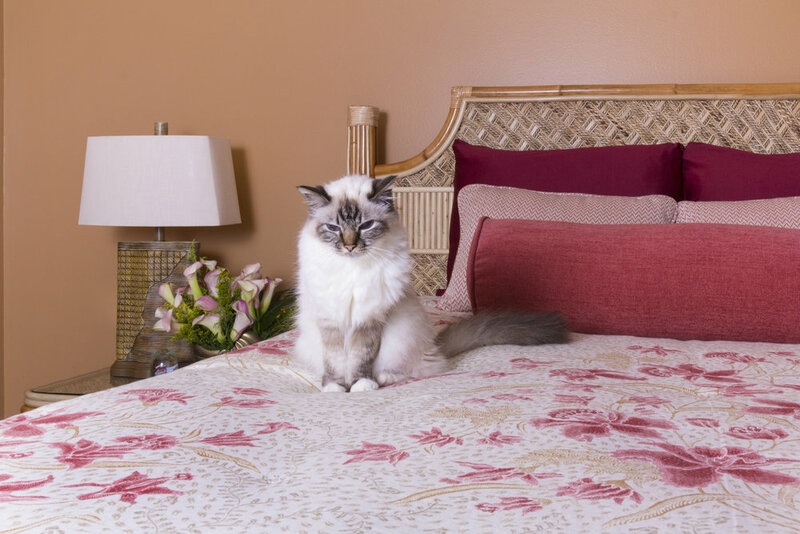 The family cat is protective of her new favorite spot on the new custom linen bedding of this coastal guest suite. Whip up a slice of avocado toast and pull up an ethically-sourced chair, because everything you wanted to know about vegan interior design lays ahead. What we know as modern veganism has been a growing movement since it’s conception in 1944, when it was defined as “the principle of the emancipation of animals from exploitation by man.” Vegans do not eat meat or animal byproducts as an expression of their respect for the autonomy of all animals, and may extend this practice into other facets of their lives. While veganism is familiar to most as a dietary lifestyle, many vegans and non-vegans alike strive for home solutions free of animal byproducts. Often made with fewer harsh chemicals and natural plant-based materials, vegan interior design options can benefit anyone concerned about the welfare of animals and the health of their home and family. Mixed linens and cotton “wool” makes for a cozy and comfortable bedroom retreat. Plants are the perfect finish to a vegan home. Ceramic and natural stone make fast friends and a guilt-free bathroom. Barnard’s firm has worked with a roster of vegan celebrity clients and is no stranger to accommodating the grueling lifestyle many Hollywood stars commit to. Animal rights activism aside; artistic, sensitive, and compassionate people need recuperation time and space that embodies their healthful ideals within their home and studio environments. The solution for many of them is a space aligned with veganism. Flemish glass adds sparkle to the upper cabinets while the simple ceramic backsplash tiles balance the excitement of the adjacent space. Hold the quinoa. What exactly is vegan interior design? Many of the fabrics and finishes on commercially made furniture are sourced from animals or their byproducts. Vegetarians may allow animal byproducts like wool or beeswax as long as the animals are treated with kindness and the fibers are processed organically. However, most vegan clients desire truly vegan interiors, spaces free from any and all animal products. Plants and art pieces inspired by nature, like this beautiful tortoise, are especially healthy additions to a vegan home. Hand-thrown pottery in a cobalt blue glaze supports a heliconia vellerigera, a gorgeous plant that looks like a furry bird of paradise. Bringing in plants, rocks, and other finds from nature is a simple way to introduce sustainable, vegan practices to your home, but working from the ground up with a designer is one of the only guaranteed ways to completely customize a home for vegan sensibilities. As increasing numbers of homeowners commit to environmental responsibility, opportunities to work within the vegan framework increase in parallel. Big names and flashing lights may have put vegan interior design on the map, but it’s the dedicated designers and passionate followers of vegan culture who will continue to carry on the torch. If you are considering going green, contact a knowledgeable interior designer to get started! For every conscious choice we make, the planet thanks us for our consideration. Renae Barnard, a local and responsible artist, created this sculpture out of paper. Barnard is a member of the American Society of Interior Designers (ASID), is certified by the National Kitchen and Bath Association (NKBA), and is recognized by the International WELL Building Institute as a WELL Accredited Professional (WELL AP), the International Institute for Bau-Biologie &amp; Ecology as a Building Biology Practitioner (BBP) and by the United States Green Building Council as a Leadership in Energy and Environmental Design Accredited Professional (LEED AP). She has served on the Santa Monica Conservancy"s board of directors and specializes in sustainable interior design, health and wellness and historic preservation.